Acura today held the world debut of the Acura RLX Concept at the New York International Auto Show, providing luxury buyers with a first look at the design and engineering direction for its all-new Acura RLX flagship sedan, slated for launch at the beginning of 2013. Utilizing highly efficient packaging, the RLX Concept delivers the interior space of a large luxury sedan with the footprint and agility of a midsize luxury sedan. The RLX Concept’s all-new 3.5L direct-injected VTEC® V-6 engine and Sport Hybrid SH-AWD® system, with three electric motors, combine to generate more than 370-horsepower, and are paired with a 7-speed dual clutch transmission (DCT) and lightweight body to deliver V-8 acceleration with four-cylinder fuel economy—with an estimated EPA (city/highway/combined) rating of 30/30/30 mpg. 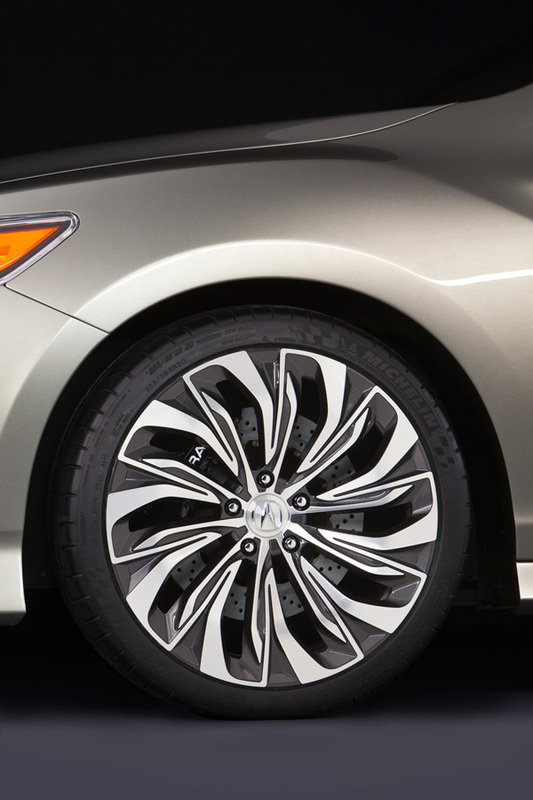 Acura also announced that the production RLX will be offered in a 310-horsepower, front-wheel-drive version, which will also deliver superior handling performance through the application of another new Acura technology— Precision All Wheel Steer™. The RLX Concept styling builds on Acura’s ‘Keen Edge’ design motif with its taut and aerodynamic shape, carefully tailored proportions, and sophisticated and distinctive detailing. Its athletic stance is accented by 20-inch forged aluminum wheels and 255/35 R20 high-performance tires. Dimensionally, the RLX Concept is approximately the same length as the current RL, but with a two-inch longer wheelbase and two-inch shorter front overhang. Both the track and vehicle width increase by approximately two inches. 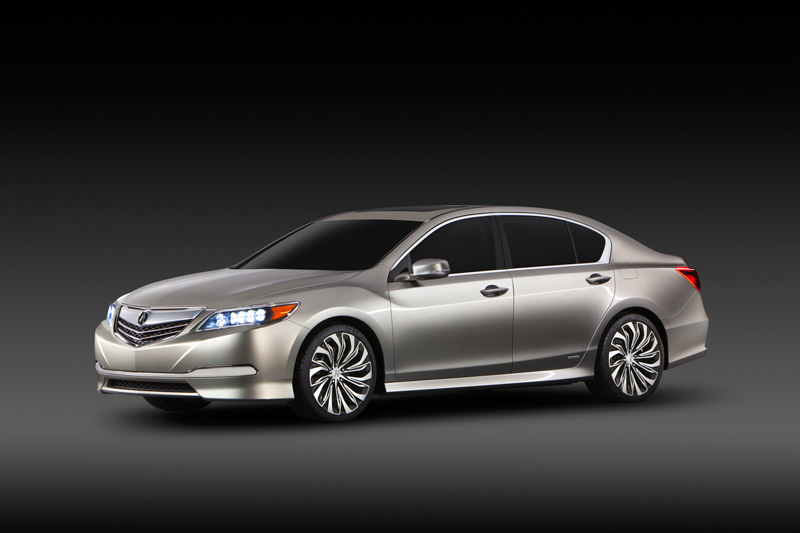 Acura’s exclusive new Jewel Eye™ LED headlamps debut on the RLX Concept. The Acura signature Jewel Eye™ headlamps use a dual-stacked array with a total of ten separate high-intensity LED lamps, with ultra-reflective optical lenses and high-gloss trim, to provide powerful down-the-road illumination while simultaneously giving the RLX a highly distinctive and bright-eyed look in both daytime and nighttime conditions. 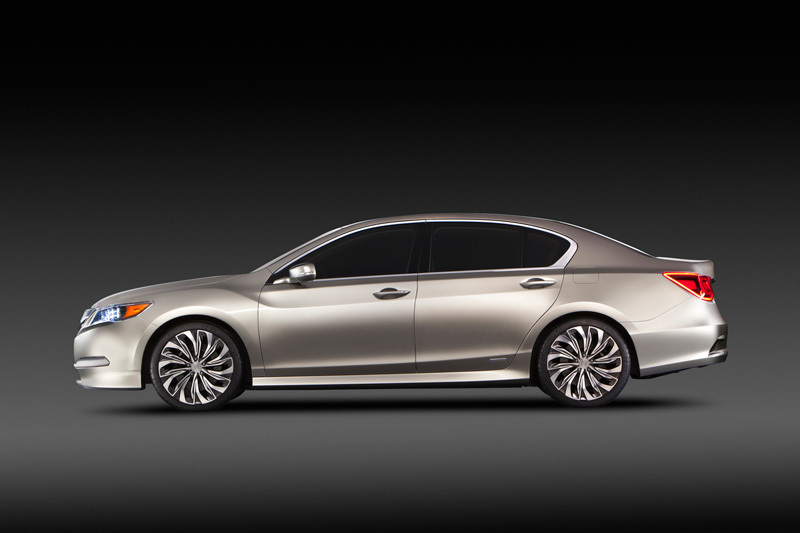 Front-wheel-drive versions of RLX will utilize Acura’s all-new Precision All Wheel Steer™ system. This system provides for independent control of the steering (toe) angle of the right and left rear wheels by utilizing electrically controlled actuators. Precision All Wheel Steer™ works in tandem with Vehicle Stability Assist™ (VSA®) and Variable Gear Ratio (VGR) steering to deliver an extraordinary level of cornering control and steering precision. All-wheel-drive RLX models add even more handling performance with Acura’s highly advanced Sport-Hybrid SH-AWD® (Super-Handling All-Wheel Drive), recently introduced at the 2012 North American International Auto Show on the NSX Concept. The performance hybrid system utilizes a front-mounted electric motor, located within the dual clutch transmission, and a unique dual electric motor drive unit with a bilateral torque adjustable control system to instantly generate negative or positive torque to the rear wheels during cornering. This provides a new level of agility and confidence to create an “on-the-rails-cornering” experience. The Acura RLX will offer an extensive array of passive and active safety features. These include a Collision Mitigation Braking System™ and the first application of Acura’s Lane Keep Assist System. 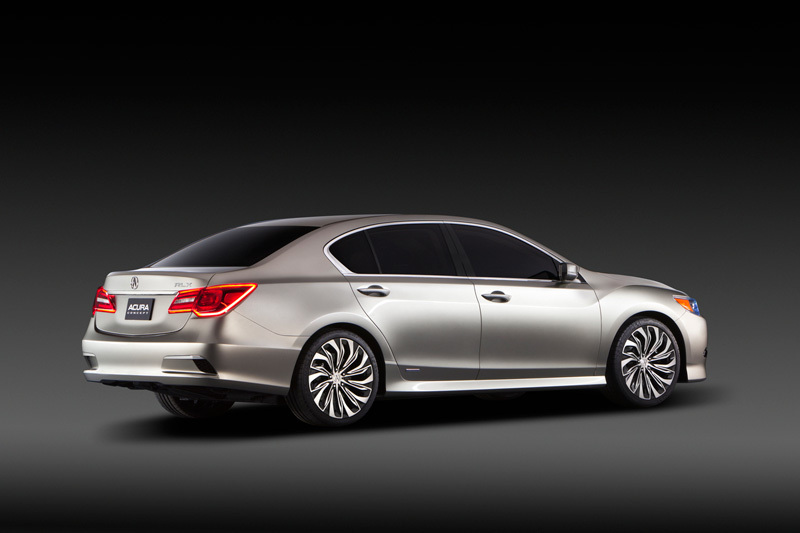 In addition, Forward Collision Warning and Lane Departure Warning will be offered as standard equipment on the RLX. Passive safety features will include front, side and side-curtain airbags for the driver and front passenger, and a driver’s knee airbag. 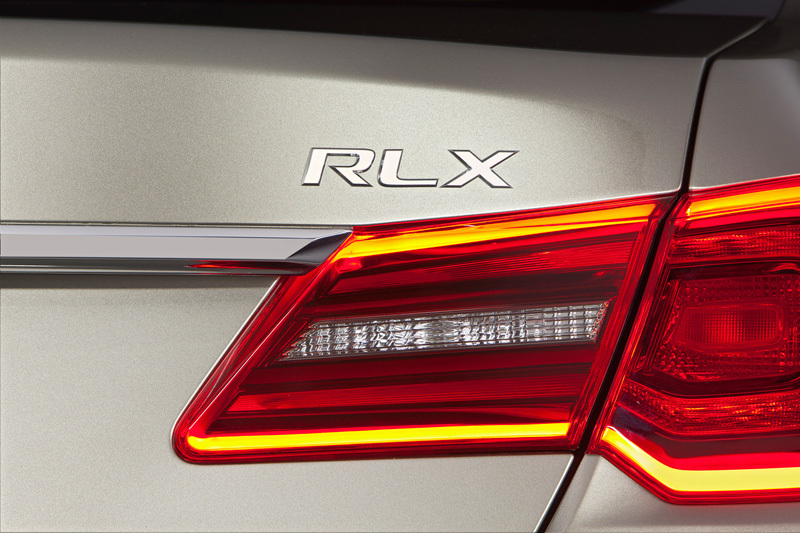 The RLX also incorporates the second generation of Acura’s Advanced Compatibility Engineering™ (ACE™) body structure, with reinforced front frame members for further enhanced frontal crash energy management. The RLX is expected to achieve a 5-Star Overall Vehicle Score from NHTSA and TOP SAFETY PICK status from IIHS. In keeping with the ‘human-centered synergy’ focus of Acura, the RLX will feature state-of-the-art communications, navigation and infotainment technologies with intuitive and easy-to-operate controls. Dual LCD screens (8-inch display and 7-inch touch screen) will provide easy and direct one-touch access to key functions — including audio, heating and cooling, navigation and voice-to-text SMS text message function. An all-new, 14-speaker ultra premium audio system will be offered in addition to Acura’s award winning ELS Surround® sound system. Both audio systems provide MP3 connectivity via USB along with integration of HD radio™, Pandora® internet radio interface and Aha Radio® interface via Bluetooth® smart phone pairing. Using Aha, RLX drivers can choose from thousands of web-based audio stations, including music, live news, podcasts, audio books, personalized points of interest, and audio newsfeeds from Facebook and Twitter. In addition, a new Acura-exclusive smart phone application integrates smart phone functions (such as email, text messaging and contacts) into the RLX’s on-demand touch screen functions. Bluetooth® HandsFreeLink® calling and pre-loaded text message replies provide for easy two-way communication. 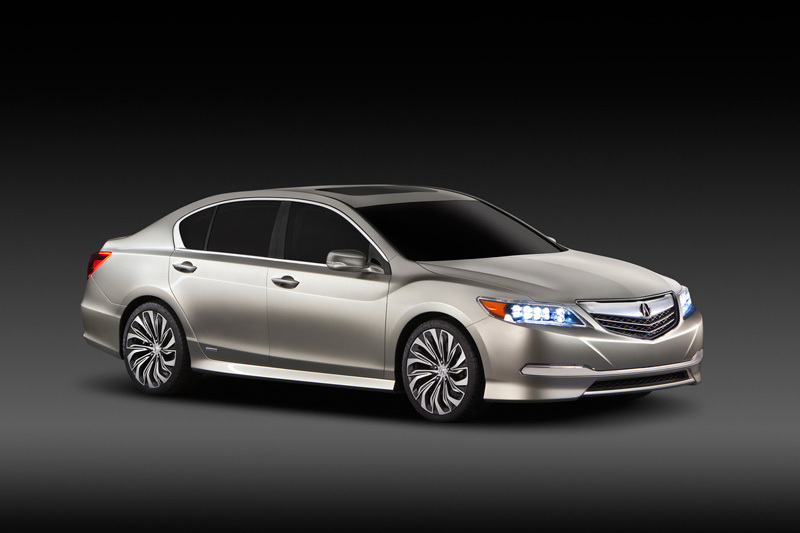 The RLX also will be available with Acura Navigation System with Voice Recognition™. This innovative system offers the driver a wide range of search options including Bing™ search functionality and the option for an AcuraLink® concierge to send a destination to the vehicle’s navigation system. In addition, the RLX navigation system will feature AcuraLink Real-Time Traffic™ for both highways and surface streets. The RLX Concept is Acura’s fourth new model debut since January 2012, when Acura took the wraps off its redesigned RDX Protoype crossover SUV, all-new Acura ILX Concept sedan, and next-generation Acura NSX Concept supercar, at the North American International Auto Show in Detroit. Acura is projecting an annual sales volume of 180,000 vehicles for the brand in 2012, which would represent a nearly 50 percent increase over 2011 sales results.